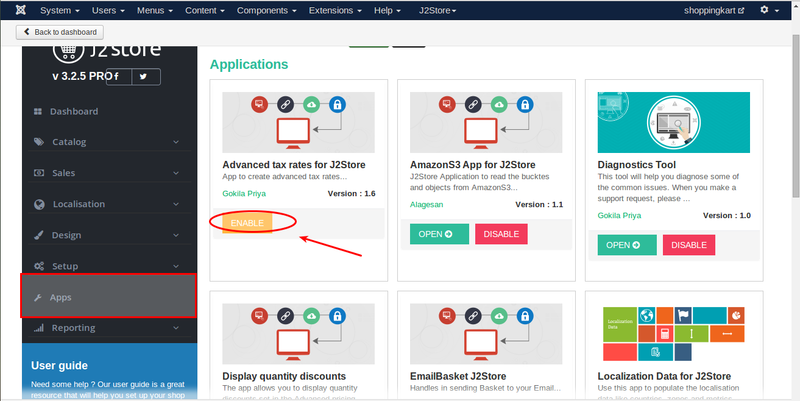 In tha backend, go to J2store Dashboard -> Apps. Click enable in the Advanced tax rate app. 4. Once the app is enabled, click an open to set the configuration for the app. Once you opened the app, you will get the screen like below. Click New on top left. Enter the name of the tax class here. You should select enabled to enable the tax class and save. Once saved, you will get the button named with View taxrates. Click on the button will show you the pop screen where you have to set tax rate for specific country,zone and postal code. Country & Zone: Choose the country and zone available from the dropdown list. Postal code: Tax will be added to the sub total when the customer's postal code matches the postal code added here. Address type: Tax will be applied based on the address type you chosen here. Priority: Set the priority and click create button. Note: You can also choose import and export to import the tax and export the tax as CSV file.